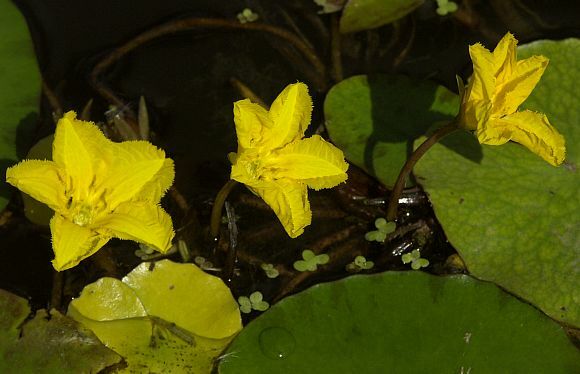 The single flowers are held about 9cm above the water level on stalks. Older leaves have a different crimped appearance around the edges. A tangled mass of stems arising from the shallow depths. Thrum flowers. 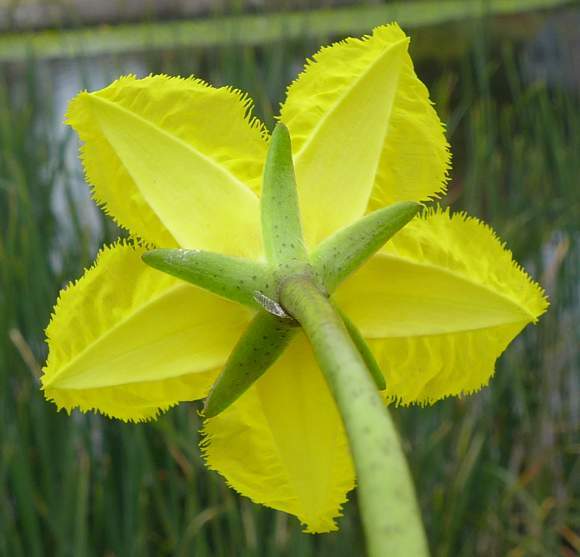 Water plants soon become bedraggled, this is the best specimen your Author has seen for no rain has occurred since the flower emerged less than three weeks ago. Thrum flowers. 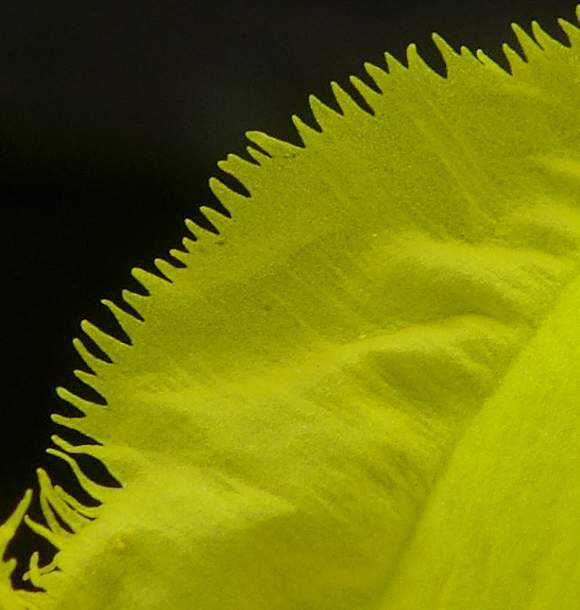 Showing the unusual, long, angled and tapering anthers. The sepals number five, are long and tapering with small blackish flecks. 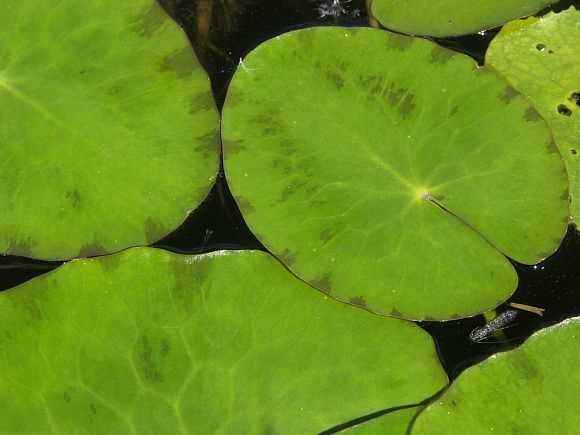 True Water-lilies have much wider sepals. Petals frayed with fine irregular teeth. Please note that Fringed Water-Lily does not belong to the Water-Lily Family [Nymphaeaceae]. 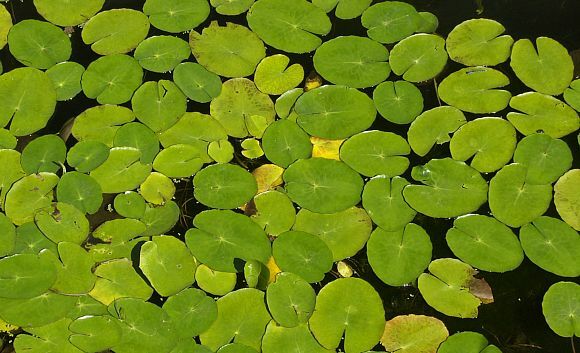 Fringed Water-lily is an aquatic plant that grows well in shallow fresh-water like canals and ponds or slow moving streams. 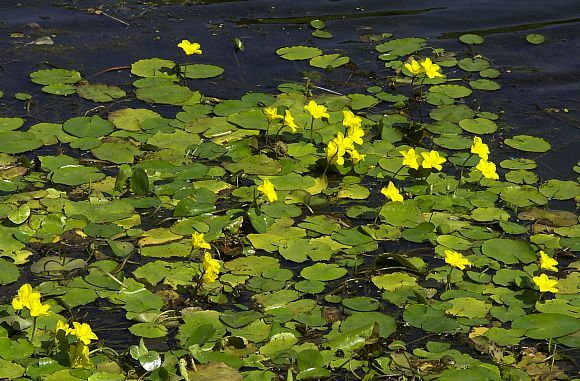 It differs from true water-lilies in that the flowers are smaller and that they are projecting above water level on short three inch stalks. 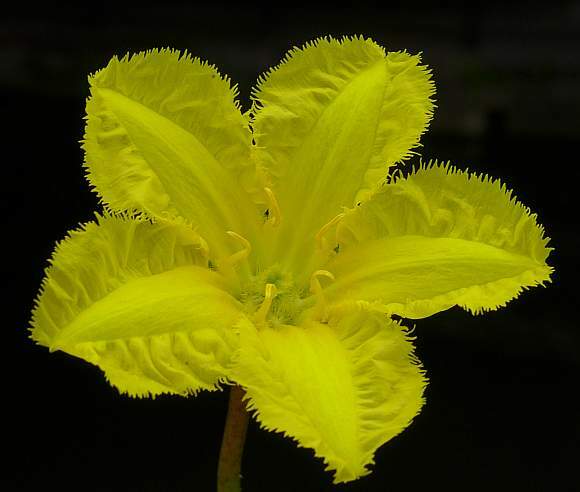 Also in that it has five petals which are frayed or fringed around the periphery and that the green sepals behind the flower are narrow and pointed (true Water-lilies have much broader sepals). 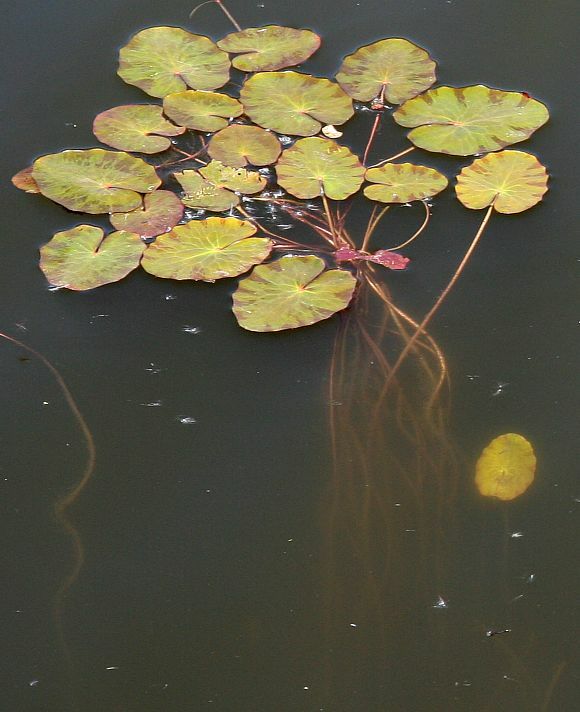 The leaves float on water, from which long stems dangle. The leaves are normally oval in appearance with a shiny appearance from above, sometimes with purple spots, and purple below. 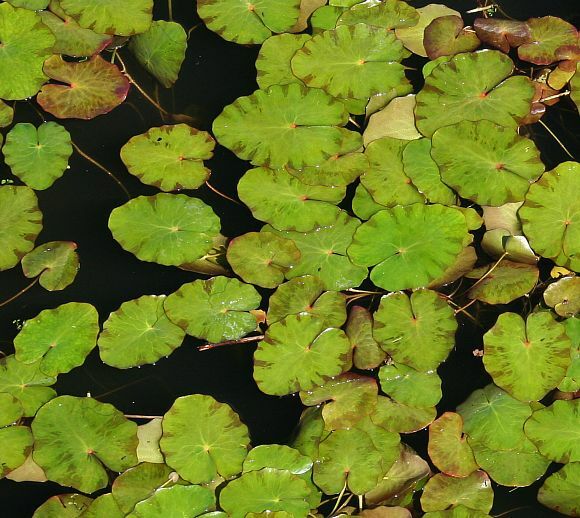 The periphery of the leaves are usually sleek but can sometimes have slightly cusped edges with brownish water-marks. 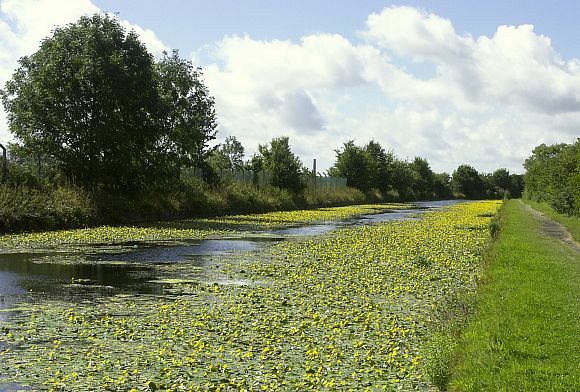 It is a frequent summer carpeter of long stretches of the Leeds and Liverpool canal between Haskayne, Lydiate, Maghull, Aintree and Bootle, and also shorter stretches of the Rochdale Canal around Castleton. 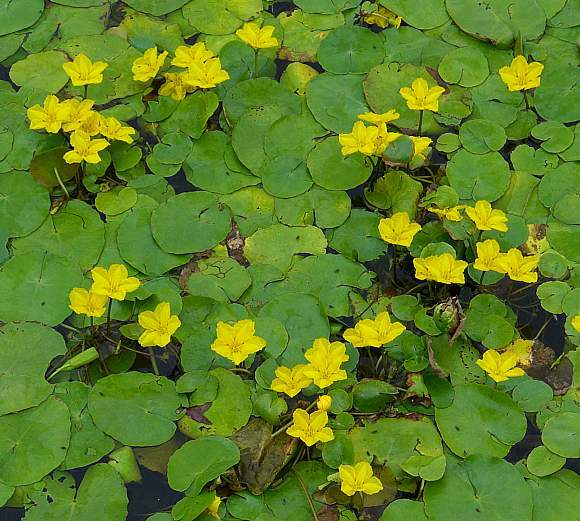 It is increasing, possibly due to discards by pond gardeners. 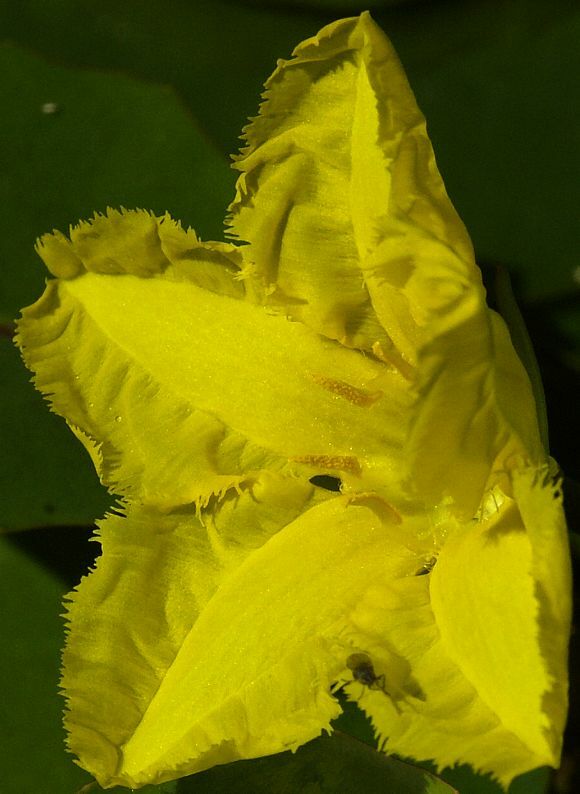 The five yellow petals are not nearly as heavily frayed or fringed as those of its only other family member, Bogbean. It is Heterostylous, where the flowers, although bisexual, come in two types, thrum and pin. 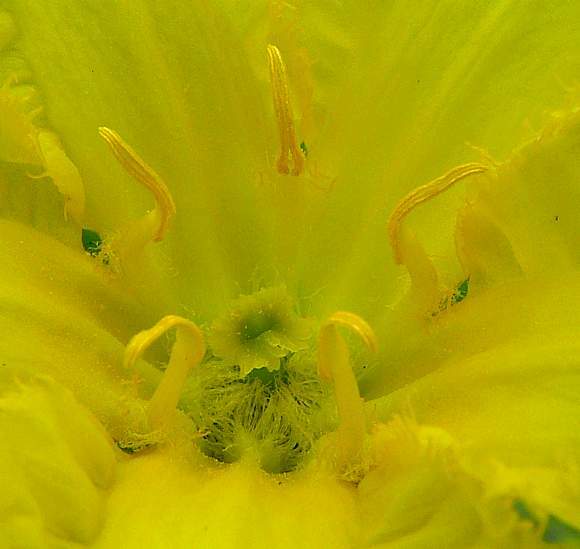 The pin form has a long style and short stamens, the thrum form is the reverse of that. Bogbean too is Heterostylous.